Looking for an affordable building site with Wolf River waterfront access?Great location! This lot is located just outside of Fremont in the River Vista Subdivision. There are 5 lots in this subdivision sharing the Outlot on the Wolf River. River frontage is per GIS map and is shared by 5 lots. Shared driveway with Lot 2. From Fremont: Tustin Rd south. Tustin Rd. turns to Hwy H. Lot is on right. 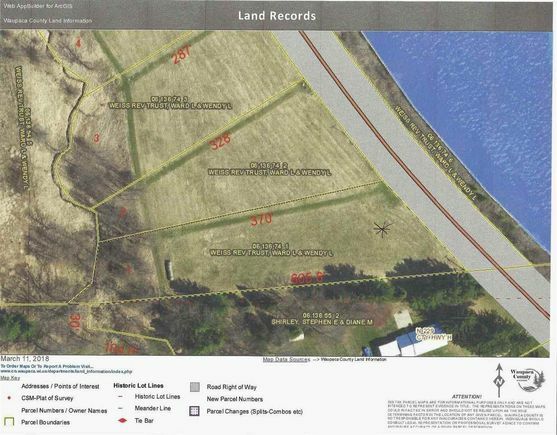 The details on HWY H: This land located in Fremont, WI 54940 is currently for sale for $54,900. HWY H is a – square foot land with – beds and – baths that has been on Estately for 391 days. This land is in the attendance area of Fremont Elementary School, Waupaca County Charter School, Weyauwega High School, Weyauwega Elementary School, and Weyauwega Middle School.